The NAD contributed 40% of the popcorn. SILVER SPRING, Md. 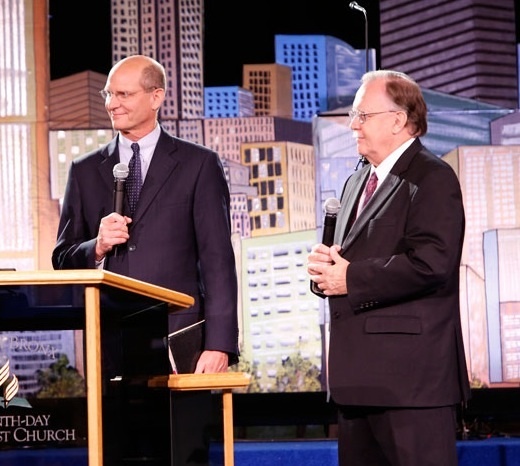 --- General Conference President Ted Wilson and North American Division President Dan Jackson have taken a 24-hour break from the daily tug-of-war in their shared Silver Spring office building. The truce will allow them to work on what their offices have agreed is an "on-again, off-again bromance that has taken a few rough turns lately," according to a joint-released statement. During the truce, the leaders have decided to view Hacksaw Ridge. The Mel Gibson-directed World War II epic tells the story of Adventist coscientious objector and Congressional Medal of Honor recipient Desmond T. Doss. Hacksaw Ridge comes out in theaters today, but Wilson and Jackson will be viewing a grainy advance copy (sent to the GC by Gibson himself) in the GC basement. Doss saved 75 fellow soldiers’ lives during the World War II Battle of Okinawa all without carrying a weapon. In honor of his peaceful example, both Wilson and Jackson have agreed to attend the screening without their pepper spray canisters. Well, perhaps one of them will not have his pepper spray canisters. If any GC personal watching this horror flick gets injured, Teddy & Dan can lower each person down from the balcony using the bowline knot and be whisked away to Washington SDA Hospital & Shady Grove for check ups. It is lawful to do good on the Sabbath (Friday night). Tell me how it turned out. Can we go to Sligo for the next showing?